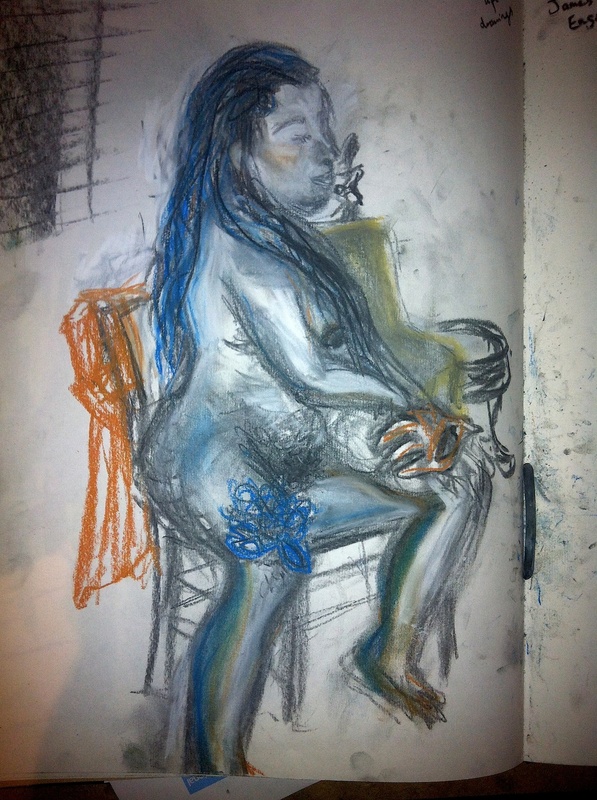 Our First Pop Up Life Drawing Session Feb 2015! It was great to be back, drawing at the Talbot pub again. We had a great range of ages and abilities, from those who are currently studying GCSE and A-Level art, to those who had never drawn before and those who are coming back to drawing after a long break. We had a wonderful model, Calu, who gave us some fantastic static dance poses and a long pose, using masks as props. We looked at the work of artist James Ensor as inspiration for the longer poses. Ensor, an 18th century Belgian painter, found that using masks as props in his work allowed him complete artistic freedom in his work. He would dress up skulls in his studio and adorn them with masks before painting these and creating his own unique and quirky narrative.